Indeed filled with passion! Passion fruit that is. These gorgeous, elegant tartlets might seem like they're full-on chocolate, but the passion fruit juice provided for a much needed zing of exotic flavor. The original recipe even called for dried apricots, but I skipped that part as I am not a fan of them. 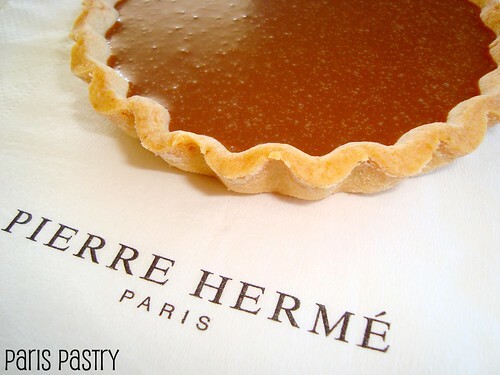 The recipe comes from one of my favorite books by Pierre Hermé and lots of bakers are often intimidated by his recipes, but they're not very hard to follow. Making a few parts the day before is incredibly helpful. I made the crust a day in advance. This tart crust recipe is my absolute favorite! It incorporates ground almonds so it has more flavor than other tart crusts (not that the chocolate/passion fruit ganache lacked any). Rating: 4 out of 5. - To mold the tartlets, butter and set aside twenty-four 1½-inch tartlets tins, fluted or plain. (I used 5 individual-sized tartlet tins) You can use mini-muffin tins, if it’s convenient. Also set aside a 2-inch round biscuit or cookie cutter, preferably fluted (or a cutter that is about ½ inch larger than the diameter of the tartlet tins you’re using), as many 3- to 4-inch-square pieces of aluminium foil as you have tins, and some dried pea beans or rice. (you’ll use the foil and beans to weight the dough while you bake the shells. - Working on a floured surface with one piece of dough at a time (keep the other piece in the refrigerator), roll the dough to a thickness of about ⅛ inch. Use the biscuit cutter to cut out as many circles of dough as you can from the rolled-out sheet. Clear away the excess dough and set it aside for the moment. Fit each round of dough into a buttered tin. To get a good fit without roughing up the dough, use a small ball of excess dough to push the dough into the bottom and up the sides of the tin. Place the tins on a jelly-roll pan and refrigerate them while you roll out, cut, and mold the second piece of dough. Place the second set of shells on the jelly-roll pan and chill the tins for at least 30 minutes. If you’d like, the scraps can be rolled and cut to make additional tartlets: gather the scraps from both pieces of dough, form them into a disk, and cover and chill for at least an hour before rolling out. - Center a rack in the oven and preheat the oven to 350ºF. Remove the pan with the tartlet tins from the refrigerator and gently press a square of aluminium foil into each tin. Put a few beans or a spoonful of rice into each tin – just enough to keep the foil in place – and bake the tartlets for about 15 minutes. Remove the foil and beans and bake the shells for another 2 minutes or so, just until they are lightly colored. (If you’re using larger tartlet tins, first bake them 18 – 20 minutes, remove foil and dried food, then another 5 – 8 minutes.) Transfer the pan to a rack and allow the shells to cool to room temperature. Place the chocolate in a large heatproof bowl. Bring the heavy cream to a boil in a small saucepan; in another saucepan, bring the passion fruit juice to a boil. Put a few small cubes of steeped apricots into the bottom of each tartlet shell, making sure to set aside a dozen or so cubes for topping. Spoon the ganache into a pastry bag fitted with a ½-inch star tip and pipe a swirl of ganache into each shell. Put a cube of apricot on the top of each tartlet and serve. You might think with this long recipe, that they were difficult to make, but nothing could be farther from the truth. I made the sweet tart dough a day in advance and the ganache was ready within minutes! This sounds like a flavor combination made in heaven! Passionfruit and chocolate will always get my vote! They look fantastic. Gorgeous. I do always find that adding fruit in some way to ganache kicks up its flavor a whole lot...my favorite is adding peach, apricot, or citrus jam to the cream. Unbelievably good. The ganache sounds just wonderful~ so rich and creamy! 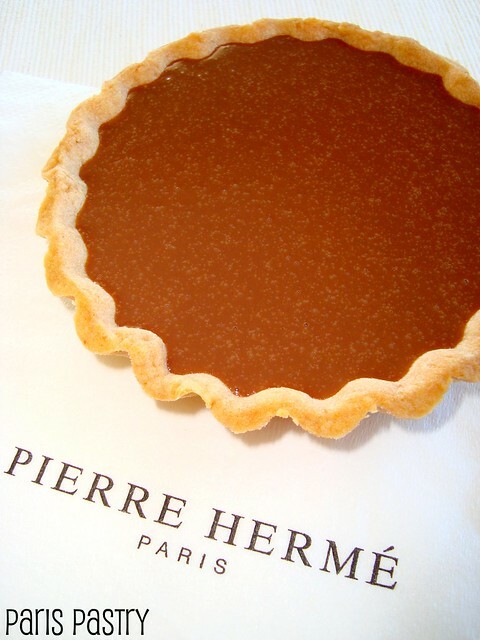 i have always afraid to get one of pierre herme book cos i thought, it will be very complicated. but guess i was wrong! thank you for the post! passion fruit and chocolate .. what a perfect combination. I agree, even Hermé's macarons book looks intimidating, but the recipes are not that bad. 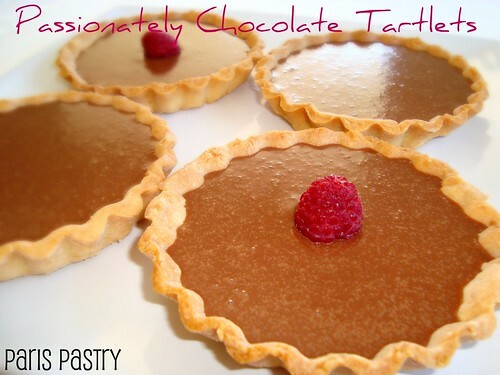 I love this tart dough--it works with everything! Looking forward to trying the ganache! Smooth and wonderful looking tart! Well done. Yum! So pretty! I've never had passionfruit and chocolate together, but it sounds tasty! I can only imagine how great that flavor combination is...makes my mouth water just thinking about it! Oh dear, just when I was hoping to stop eating cakes/pastries/chocolate (need to loose some weight). This recipe sounds far to divine not to try very soon.